Nokia 5300 XpressMusic is a slider mobile phone by Nokia, part of the XpressMusic range. It was introduced on 26 September 2006 and released at the end of that year. It runs on Nokia Series 40 3rd Edition FP2. The phone has a sleek slider design and features a 240×320 pixels (QVGA) TFT display and a 1.3-megapixel (CMOS) camera which can be used in landscape. It has dedicated music buttons on each side which makes it easy to access tracks in music player mode or tune in different stations in radio mode, with a 2.5 mm. headset jack. It has also a powerful loudspeaker at the back for high quality sound output. It also features a removable MicroSD card with a maximum capacity of 2 GB and powered by an ARM9 CPU running at 237 MHz. Nokia 5300 XpressMusic was launched on T-Mobile's USA network on 1 March 2007. 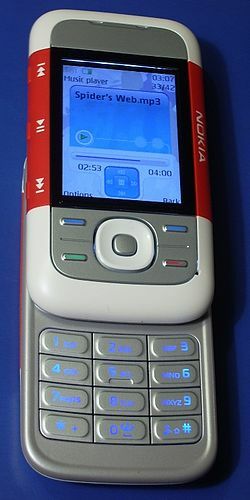 Nokia 5300 can browse and surf the internet via GPRS. The phone can access different web or mobile sites like Friendster, Yahoo! Mail, Yahoo! Messenger, Google, YouTube, Multiply etc. The phone also features the Active Standby mode which can create shortcuts while on standby mode. It has a dedicated keys on sides let you access to music or just push camera button to start camera or video mode. The best view when you play your video is on panoramic view. These are the Menu options of Nokia 5300: Contacts, Log, Organizer, Gallery, Messaging, Media, Applications, Web, Settings, PTT and the user's SIM network services. The Nokia 5300 is generally comparable with the Nokia 5200. Display 1.8 inch. 2 inch. Weight 104 g. 106.5 g.
Wikimedia Commons has media related to Nokia 5300. This page was last edited on 6 October 2018, at 16:14 (UTC).